In this, the very first episode of Progressive Podcast Australia, we look at the Occupy movement in Australia and beyond. 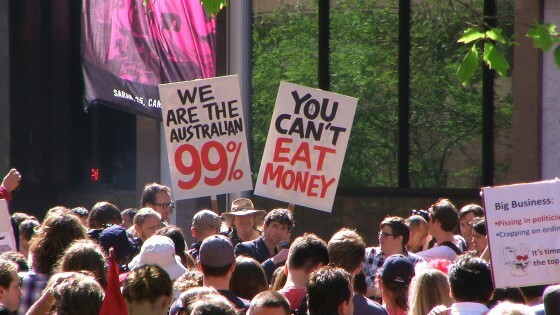 Firstly, we respond to criticisms of the Occupy movement from right-wing journalist Andrew Bolt and others. We mention the United Nations report that pointed out that the richest 1% of adults alone own 40% of global assets and we also talk about inequality within Australia. Other issues we cover in the podcast include neoliberalism and inequality, people making fun of the protests online, anarchist-type communities at the Occupy’s, unity and diversity in the Occupy movement, the acknowledgement of other animals as victims of corporate greed, and direct action against the big corporate banks. You can sign up to our Facebook and Twitter pages to get regular updates about the podcast. You can listen to this report on Citizen Radio here. You can now subscribe to our podcast on iTunes here. We have just put together some interviews and analysis of Occupy Perth and our friends at Citizen Radio have played it on their awesome podcast. Stay tuned for our first episode coming very soon – like us on Facebook and/or follow us on Twitter and you’ll be notified once it’s up. In the meantime, we encourage everyone to listen to us on Citizen Radio and support Citizen Radio and Citizen Radio Productions. Progressive Podcast Australia promotes pro-animal rights, anti-racist, pro-feminist and pro-queer messages. We also discuss other issues, such as capitalism, the environment and war. There is an Australian focus, with discussion, interviews and political music. First episode coming soon, you can stay up-to-date with the podcast by signing up to our Facebook page and Twitter account.